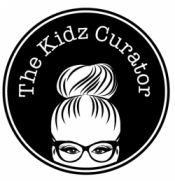 But who IS ‘The Kidz Curator’?!! I’m Rosie. I’m 35. I’m British, born in Oxford, raised near Solihull but moved to beautiful Australia in January 2006 with the love of my life Adam after he was offered an amazing job opportunity here. My working background is mostly in life insurance… I worked for one of the major banks in their insurance arm from August 2006 to sometime in 2014 when we made the big decision to move from the bright city lights of Sydney to sleepy Radelaide. Prior to this we squeezed a heck of a lot into our busy lives – we’ve moved 6 times, we’ve got engaged and married, we’ve built a house, we’ve had 2 dogs and 2 cats join the family we’ve been on numerous holidays and trips back to the UK to visit family & friends and then of course there are our greatest accomplishments – the birth of our little boys Tate in 2011 and Evan in 2014. So now we live in a quiet, almost rural suburb about an hour South of Adelaide – quite a change of pace from our Sydney days. Hubby has his own company which is still based in Sydney though so he splits his time between here and there. I officially work for him 4 days a week although he’d probably beg to differ… Tate is three quarters of the way through kindy and Evan is at daycare 3 days a week. We are about 80% the way through renovating a house we bought back in late 2014 and starting to wonder what we are going to do once it’s all done! Most of you will know that The Kidz Curator started life as @kmart_kidz. I’m not going to lie I am just slightly Kmart obsessed – I discovered the wonder of Kmart when I was on maternity leave with Tate and often used to frequent their Warriewood store on the Northern Beaches in Sydney, never leaving without a $2 tote bag full of goodies. One day in early 2015 I was doing my usual scroll through Facebook as Evan was having a nap and came across an online article about the rise in popularity of Kmart, particularly in response to the forming of Instagram ‘fan’ accounts such as @kmart_bargains, @i_heart_kmart & @the_kmart_forecast who to this day remain 3 of my absolute favourite Insta accounts to follow. It got me thinking that I’d love to do something similar, but just for kids, as this is where my interests lie, and after a little research I discovered that there wasn’t really anything similar on Instagram yet and so @kmart_kidz was born! My first post on @kmart_kidz was a truly terrible ‘flatlay’ of one of Tate’s Kmart outfits, lying on a Kmart rug… not my greatest piece of work but hey we all need to start somewhere, right?! 3 likes… and 1 of them was me!!! After that I soon learnt that searching for and reposting other peoples’ far superior photography of their Kmart finds or grabbing screen-shots of new stuff from the Kmart website was the way forward and so the phenomenon that was @kmart_kidz was born! All good things must come to an end though and around the beginning of 2016 I felt that, perhaps, @kmart_kidz had reached its peak and it was time to go out on a high – it literally got to the point where I was sure I had posted every item of kid-related stock on Kmart’s shelves and it just wasn’t fun any more… so, after a lot of thought, I decided to spread my wings and branch out to include other, well-known Aussie brands, big and small, that met my brief of being affordable, fun and on-trend. In the first couple of weeks of The Kidz Curator I lost close to 2,000 followers. Yes, 2,000. I’m not gonna lie I was devastated – I expected a drop but not that much – people really, REALLY love Kmart huh?! I had moments where I thought about changing back again, about throwing in the towel altogether and deleting Instagram in a big hissy fit, but then a few little rays of sunshine started to peek through the grey clouds – the odd comment here or there from old faithful followers saying how much they were enjoying my new direction, direct messages of heart-felt support from some of the accounts mentioned above, likes and comments from the brands I was posting about (which was always a rarity in my @kmart_kidz days) and, even better, I started getting new followers and, eventually, more new followers than lost followers each day – hurrah!!! I am absolutely loving the account now – there actually aren’t enough hours in the day to dedicate as much time to it as I’d like to and soooooo many doors and opportunities have opened up for me as The Kidz Curator. I love my new freedom to post whatever the hell I want, I love being able to support some of the amazing smaller businesses on Instagram (MORE on that soon – stay posted!!!) and most of all I love all of my followers and all of their likes and comments – I do try to read them all and one of the best feelings is when someone says that something I’ve posted is exactly what they’ve been looking for or, even better, posts a pic of something they’ve bought because they saw it on The Kidz Curator! I’m a Sales & Marketing department’s dream – hahaha!! If you’re still reading, CONGRATS for getting this far. It’s been fab telling my tale about the highs and lows of Instagram and I’m hoping that with the addition of this website the future can only be even rosier!